Stir, designed by Frank Gehry at the Philadelphia Museum of Art. The renowned architect Frank Gehry — who is transforming the Philadelphia Museum of Art's public spaces as part of the museum's master plan known as the Core Project — will have his hand in a renovation of the restaurant and a cafeteria to open this fall. Stir, operated by Starr Catering Group, will be the only Gehry-designed restaurant offering fine dining to the public anywhere on the East Coast. It is scheduled to open Oct. 9 and will be the first sign of Gehry's touch at the Art Museum. The Core Project, for which work started last year, is scheduled to be completed in 2020. 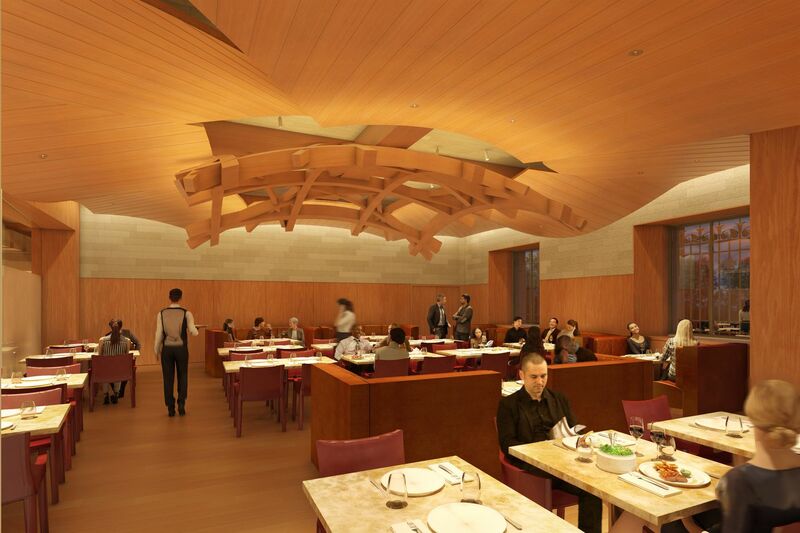 Stir's centerpiece will be a striking sculptural element, shaped in Douglas fir and flowing in form, that extends across the ceiling above the main dining room. Ceiling and walls also will be clad in Douglas fir. Floors will be red oak, and Gehry plans to use frosted glass, felt, steel, leather, bronze, and onyx. The kitchen will be at least partly open. "What is exciting for us is that he maximized space by opening up the food and dining to views of the East Terrace and its views of West Philadelphia," said Gail Harrity, museum president and chief operating officer. Starr Catering — no longer affiliated with Starr Restaurant Organization — coined the name, Harrity said. "It instantly conjures up the idea of stirring not only a cup of coffee or soup but also a can of paint," she said. It's also an active word — "something that spoke to the values of the museum." Executive chef Mark Tropea, a Glen Mills native who owned the BYOB Sonata in Northern Liberties, plans a locally focused menu including roasted Jersey peaches, seared Barnegat scallops, corn bisque, dry-aged burger topped with Lancaster cheddar, and wild mushroom frittata. The beverage menu will feature mixed drinks, wines by the bottle and glass, and local beers. A new, full-service cafeteria, much larger than the museum's previous cafeteria, will seat 160 people and will extend the entire width of the building, with windows offering views to the East Terrace and its garden on one side and across the Schuylkill to West Philadelphia on the other. It will have stations for sandwiches, salads, brick oven pizza, and specialty coffee. When the North Entrance at street level opens in early 2019, visitors will get a new espresso bar in the Vaulted Walkway that is being made accessible to the public once again, for the first time since the mid-1970s. It will be open Tuesday to Saturday for lunch, as well as Sunday brunch. Stir and the cafeteria will be open to museum visitors — not the general public — but the Sunday pay-what-you-wish policy will make the brunch a popular option, Harrity said. Artist’s rendering of the Philadelphia Museum of Art cafeteria, designed by Frank Gehry.